What to do when posBoss is no longer connected to the Verifone Terminal? Most likely causes: Verifone terminal not set up correctly, changes on network or configuration, network/router issue. Is the Eftpos button no longer there? Click below. Where is the eftpos button? Head to Settings > Eftpos on the posBoss iPad Till app. 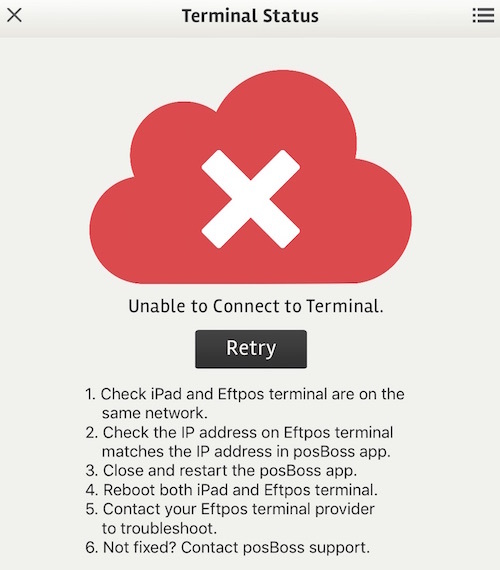 If posBoss and your eftpos terminal are not connecting, you should see the page below. If you're seeing the page above you need to make sure that the IP address from the Verifone terminal is matching the one in posBoss. To check this, press the settings button at the top right and enter in the address from your terminal. Eftpos Terminal Provider = Where you purchased the terminal from and supports you for any issues. Are you getting an error that says the transaction was refused? This usually means that Verifone has not been set up correctly. They need to set the terminal up for an IP interface listening on port 20001. Do this by creating a record on the TMS (terminal management system) which is called Vericentre. They then download this into the terminal which completes the terminal piece. On the odd occasion, posBoss files can get a bit mixed up, especially if swapping over terminals between iPads. Try a delete and reinstall of posBoss to see if that fixes the issue. From there it should be as simple as following the initial setup article to configure posBoss to talk to the right IP address. Most eftpos issues that occur between posBoss and the eftpos devices are caused by underlying issues on the Router. Try restarting your router. Turn off the router for a full minute then restart it. Leave it for another couple of minutes. Please note: If you have Star printers, the IP address may have changed so you may need to search for them and enter in again to the posBoss printer settings. Have there been any recent changes on your network? You may need to contact your IT provider to assist. Depending on your terminal setup, you may have to press enter after cancelling a transaction on the terminal to send this information back to posBoss. To remove the need to press enter, contact your Eftpos terminal provider to get them to configure this for you. Check with your Eftpos terminal provider what your cutover times are and make sure they match your trading hours. Are your team putting through manual transactions that aren't recorded in posBoss? If this is happening and causing issues, speak with your Eftpos terminal provider to configure manual payments to be accessed via a menu to make it less easily accessible.